Scotland's marine ecosystem faces "irrecoverable damage" from salmon farming if environmental concerns are not addressed, according to MSPs. Holyrood's environment committee said fish mortality was at "unacceptable levels". Salmon is Scotland's single biggest food export - worth £600m - and is estimated to provide nearly 2,500 jobs with thousands more supported by the aquaculture sector in rural and coastal communities. But it has faced continuing problems tackling parasitic sea lice which attach themselves to the skin of the fish and can be transferred to passing wild salmon. With the industry planning a huge expansion over the next decade, the committee said Scotland is at "a critical point in considering how salmon farming develops in a sustainable way in relation to the environment". Some environmental groups have raised concerns about the use of chemicals to treat the lice and the risk of killing the salmon by bathing them in warm water to "shock" the lice into falling off. The report also called for a "precautionary" approach to expansion of the industry based on outstanding environmental concerns being resolved. It added: "The status quo is not an option." The Scottish Salmon Producers' Organisation said: "Until the report is officially published and the industry has time to read and consider its findings we cannot make any specific comments. "However, the industry takes this Inquiry very seriously and has provided written and oral evidence to the committee to highlight our commitment to long-term sustainability through high standards of fish health, husbandry and environmentally responsible production. "With investment of over £50m in new innovations and around £10m per year spent on research, it is clear that the Scottish salmon farming industry is proud of its achievement to become the UK's top food export. "We are determined to address any challenges to the sector maintaining that position." 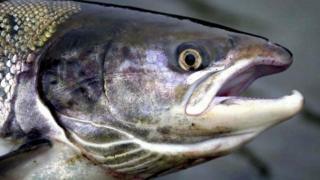 The body which lobbies for the preservation of wild fish stocks in Scotland's rivers has welcomed the report. Salmon & Trout Conservation Scotland director Andrew Graham-Stewart said: "This is a complete vindication of what we have been arguing for many years now, often in the face of denials and opposition from within Scottish government and Scottish public authorities, that open cage salmon farming in sea lochs is way out of balance with the environment, particularly with the conservation of wild salmon and sea trout." He added: "In the short term, there must be an immediate moratorium on all new farms or any expansion of existing farms, until all impacts, including those on wild salmon and sea trout are under proper control, which the committee clearly realises is not the case today." The report on the environmental impact of salmon farming is being sent to the Scottish Parliament's rural economy committee which is conducting a wider inquiry into the sector.